The Seaholm Development District is a former industrial section of southwest downtown Austin that is undergoing a transformation into a vibrant urban neighborhood. 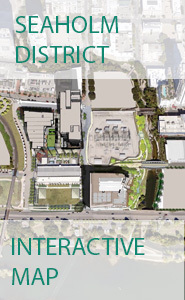 At the core of the district is the decommissioned Seaholm Power Plant which will be redeveloped into a landmark residential and retail destination. Construction is on-going in the district. Portions of the Seaholm Power Plant redevelopment are complete and occupied; the condominium tower occupancy is anticipated in the 1st Quarter of 2016. Austin's new central library will be complete in the 4th Quarter of 2016. The former Green Water Treatment Plant property Block 1 (Northshore Apartments) and Block 23 (500 W 2nd Street Offices) are well underway. Block 188 (Austin Proper Hotel and Condominium) is expected to break ground in 2016. The former Energy Control Center Block 24 (The Independent Condominiums) had its official ground breaking on 01/11/2016. This website is intended to keep the community informed about redevelopment in the district. For private sector projects, please contact the appropriate developer for information. The Seaholm District consists of 85 acres of former industrial land that will add approximately $2 Billion to the tax base when complete.